With the swearing-in of Illinois Gov. J.B. Pritzker, who campaigned on cannabis legalization, a new adult-use cannabis bill is set to be proposed in the coming months. State Rep. Kelly Cassidy, D-14th, and Illinois Sen. Heather Steans, D, who’ve been on the forefront of the fight to legalize cannabis, expect to roll out a bill in the coming months which would allow people 21 years and over to possess one ounce of cannabis and grow up to five plants, among other things. The bill is set to be proposed by the end of the state’s legislative session this May, according to Rose Ashby, who works as the field director for both legislators on issues pertaining to cannabis legalization. If passed, Ashby said the goal is to have adult-use cannabis sales by 2020. This isn’t the first cannabis legalization bill proposed by Cassidy and Steans. In 2017, they proposed a similar legalization bill which Ashby said primarily served to spark a conversation about what legalizing cannabis for adult-use would mean. The bill was unlikely to pass under the Bruce Rauner administration at the time, Ashby said. While the 2017 legislation died with the new Pritzker administration, Ashby said the “nuts and bolts” of the new bill will be similar to the last. If proposed, the bill is also set to include policies about where the cannabis industry can be located geographically in the state. “One of the ways that we are addressing the non-homogeneous state of our local communities is we are letting local communities decide where and how industry would look,” Ashby said. For example, towns could decide if they want to let the industry in and employers could choose whether or not they want a drug-free workplace. She added public consumption, including driving under the influence, will remain illegal as was set in a 2016 decriminalization bill also sponsored by Cassidy and Steans. Part of the bill will work to align the consequences of underage cannabis consumption with those related to underage alcohol consumption in the state. Ashby said this could mean the loss of one’s drivers license, which is currently a consequence for underage drinking in Illinois. Beyond these regulations, Ashby said another important part of the bill will be to address the failure of the war on drugs — the anti-drug movement popularized by President Richard Nixon in the 1970s — and how it’s impacted communities of color in Illinois. The proposed bill would offer expungement of criminal records, work to diversify the cannabis industry and implement a Restoring our Communities program — a grant program where a portion of the state’s cannabis revenue would go toward local communities disproportionately impacted by the war on drugs. It’s unclear exactly which cannabis charges will be expunged. Ashby said the bill will also bring new economic resources to the state. In his proposed budget for the 2020 fiscal year, Pritzker planned for revenue from adult-use cannabis. Pritzker didn’t respond to requests for comment. However, Ashby said there’s some uncertainty about how much the industry will bring in. “It’s a difficult projection to make because it is somewhat dependent on how many folks leave the dealer and go to the legal market,” Ashby said. Ashby referenced a report by the Marijuana Policy Project — a pro-cannabis advocacy group — which found approximately 750,000 adults in Illinois reported consuming cannabis in the past month. According to Ashby, Illinois is just shy of having 60,000 medical patients which means the remaining cannabis users are buying it illegally. “Any projection has to contemplate us flipping the switch and those folks coming over,” Ashby said. 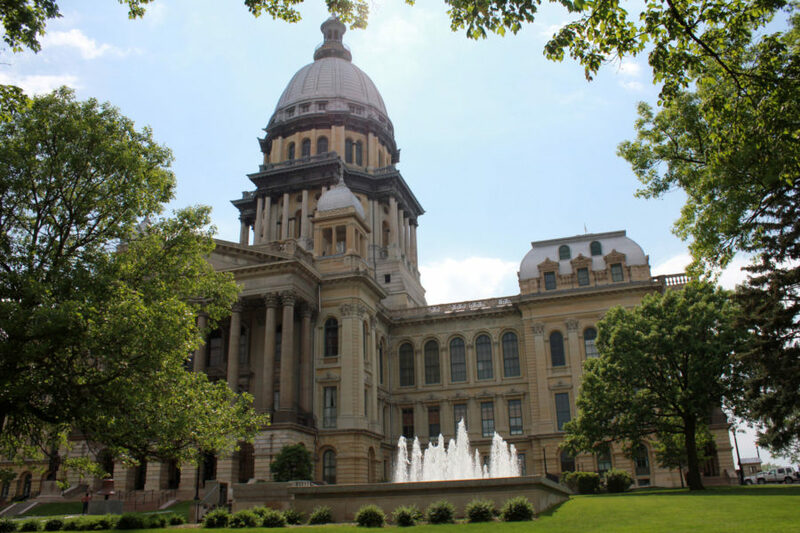 Ashby noted a 2018 report by the Illinois Economic Policy Institute — a non-profit group which conducts research on the state’s economy — which found cannabis legalization could bring $525 million in new tax revenue to the state. Illinois already has a market for medical cannabis. People with medical conditions such as HIV/AIDS and Post Traumatic Stress Disorder, can register to purchase cannabis from 55 licensed medical cannabis dispensaries. In the drafting of their legislation, Cassidy and Steans also commissioned a two-part study by the legalization consulting firm Freedman & Koski. The first part examined whether the state’s current medical industry would be able to serve the demand once cannabis is legalized. It predicted the medical industry only has the capacity to supply between 35-54 percent of the demand. The second part looked at the policy approaches to legalization and provided a number of suggestions on the best routes to take, Ashby said. She added one of the goals of the legislation is to reduce youth use of cannabis. “What we know in states that have legalized is that youth use declines because drug dealers don’t card and the dispensaries do,” Ashby said. She said the legislation will help promote a conversation on how consuming cannabis can be harmful to youth.